I have recently taken up crocheting again. I have taken up crocheting many times throughout my adult life, but never gotten very far, because I thought I should start by making something, and I didn’t like the way my projects looked. This time, I am trying a different approach. I am just practicing. In my perfectionism, I have always thought I needed to be making something specific, and it needed to be beautiful. Of course, since I was new at it, my stitches were not beautiful. I mean, some of them were, but overall, I made very uneven efforts. 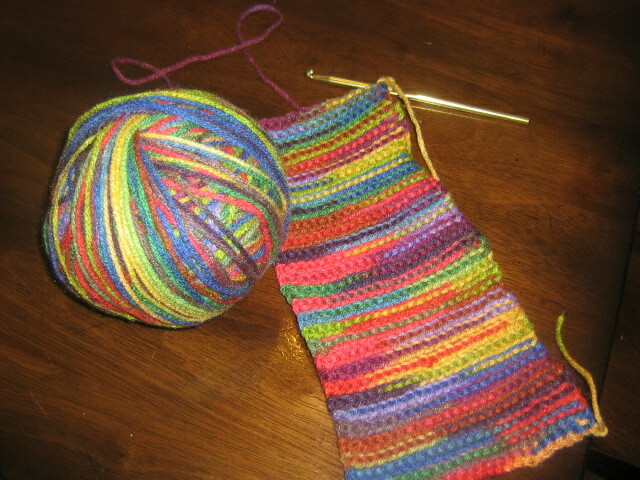 After a few days of this, I would look at my work, think, “ No one will ever want to wear this scarf*!”, and give up again. This time, I am just practicing stitches. Who cares if they look bad or uneven? It’s just practice. I don’t just have this problem with crocheting, either. I have it with nearly everything I do. I know that the only way to get better at anything is to keep doing it, over and over again, looking at the results and trying to improve. But I don’t like the practicing part. I want to jump right to the end, where (for instance), my house is perfectly organized, I make beautiful sweaters and afghans, and my writing is brilliant. I have been working on the writing thing, too, posting both here and at gaminangels.com more often, but I want to get an even better routine. To challenge myself, I am signing up for National Blog Posting Month, or NaBloPoMo. This is going to be a stretch for me, as I don’t really have a daily writing routine, but that is the point of this exercise. Obviously, these rules leave a lot of leeway, so who knows what we’ll see here! I will try to be interesting, but I could be writing about any number of topics, from current events to books to science fiction to family stories. I am interested to see what I want to write about when I am forced to do it regularly. As for my crocheting, I will eventually move on to a project, probably another scarf, but I am working hard to enjoy the process. It is fun to look at my progress, where I have improved and what I still need to work on. The time I spend working on the stitches is very relaxing for me, and I am getting better. * Yes, it was always a scarf, what else is so easy to start with? I suppose pot holders, but scarves provide more practice time, and I pictured myself wearing them out in public, with everyone asking me where I got that beautiful scarf. Then I would modestly admit that I made it myself and they would be amazed. Yeah, perfectionism.